Psychotic State Book Reviews: Psychotic Book Review: "The Family Fortune"
Psychotic Book Review: "The Family Fortune"
"The Family Fortune" by Laurie Horowitz is a modern retelling of Jane Austen's "Persuasion" but it's a delightful read whether you are an Austen fan or not, or familiar with "Persuasion" or not. Jane Fortune is a Boston woman in crisis. She's pushing 40 (38, in fact), she's unmarried with little prospects, her family fortune appears to be in serious jeopardy and her first love, author Max Wellman, is back. Jane edits a literary journal, which she founded, and while she has great satisfaction from finding the next literary genius, she years for true love. The first great literary genius she found, Max Wellman, went on to become a successful novelist. She still pines for Max, who she left 15 years earlier on the advice of her mother's oldest friend, Priscilla. To further complicate matters, the family finances are in peril - - a fact which Jane's father Teddy can't understand and Jane's older, and unmarried, sister Miranda refuses to understand. Jane's younger sister Winnie is too busy suffering from her own ailments to concern herself with her family's troubles, and that includes her husband and her own sons. 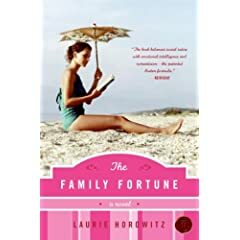 "The Family Fortune" is told from Jane's point of view and what makes the book such an enjoyable read, besides the obvious Austen connection, is Jane's likability. You root for her and you want her to succeed, feeling that she deserves a better fate than being treated as little more than a servant by her own sisters and father. Jane isn't stupid, she's merely sold herself short for far too long. My only complaint, if you can call it that, with this book is that I don't believe the character of Max was developed enough. I wish we could have seen more about why Jane fell so madly in love with him. Regardless, "The Family Fortune" was well worth the time spent to read it - - less than six days for me (not bad, revolving around my full time work schedule and family). I would definitely recommend it to any Austen or romance fan. But of course . . . The (Un)Real Housewives of Atlanta are Back! Psychotic Review: "Bundy: A Legacy of Evil"
Psychotic Review: "Drop Dead Diva"
Psychotic Review: "See You in a Hundred Years"
Psychotic Review: "Three Wise Girls"